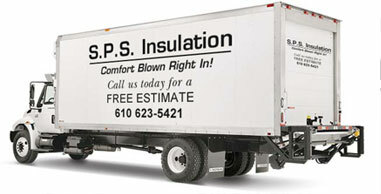 SPS Insulation can increase your comfort by addressing temperature control at the source... Your thermal envelope, your attic and walls. Cold and drafty rooms in the winter and hot upper levels in the summer can become a thing of the past. Blown in insulation is the best way to ensure a comfortable and affordable indoor living environment. Stop the cold and stop the heat before it gets in! SPS Insulation will insulate your existing walls, attics, crawl spaces, and more... anywhere you may have temperature control problems. Plaster walls? No problem! We can blow insulation in behind your existing wall surface for thousands less than if you were to demolish and re-drywall. You could begin to save hundreds of dollars on the cost of heating and cooling year after year while delivering superior insulation! SPS Insulation specializes in residential retrofit insulation. Often your problem with the insulation surfaces after living through the first heating or cooling season. Our trained mechanics carefully protect your home's contents before any work begins. We cover your floors, walkways, doorways and furnishings, treating your home delicately as if it were our own. Perhaps you have tried new windows and doors or even insulated siding without the results you were expecting--blown-in insulation will make the biggest difference of all. Guaranteed. Comfort and savings blown right in! With the increasing cost of electricity, natural gas and heating oil You Can Fight Back! Brian Snedeker chose to work in this industry because many homeowners could be more comfortable and save money if insulated with excellence. I love working in the Mid Atlantic Region because there is a beautiful variety of architecture. Through the years we have served many customers in our region and continue our quest to offer the very best insulation services. We are able to serve on average 500 clients a year. Read here what they have said about our services.